For the vast majority of brands and companies, building a Facebook presence is a tall task. Very few companies have the luxury of being a big name brand like Coca-Cola, Skittles, and Ford. Most companies just don’t have the history and budget to establish themselves as household brand names. But social media has been leveling the playing field, and companies like Bonobos are using properties like Facebook to establish and spread their burgeoning brands. 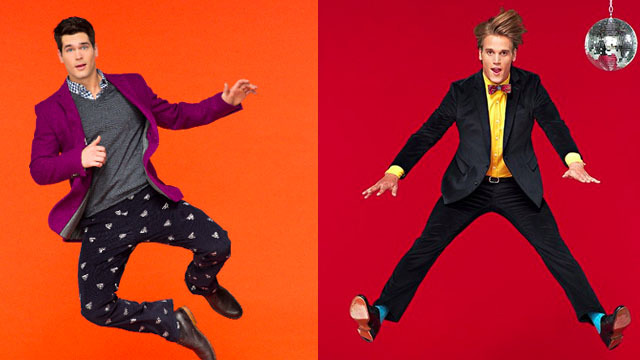 Bonobos is a venture-backed men’s clothing company that was founded in 2007. The fashion brand started with its signature line of “better-fitting” pants, and has since grown to include apparel and shoes. Along with its trademark pants, Bonobos is becoming known for its superb customer experience (Bonobos customer service reps are famously referred to as “Ninjas,” though that’s a trend that’s made it to many other companies now). 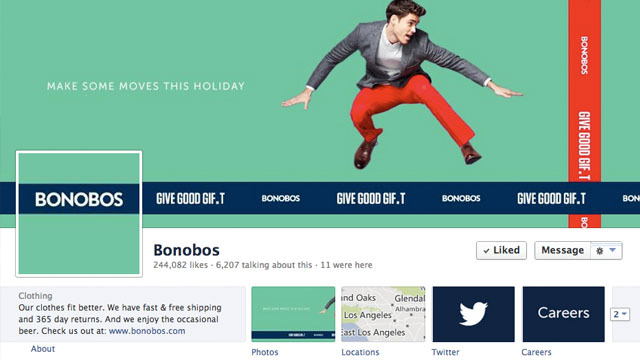 Bonobos’ Facebook Timeline presence is a natural extension of its core brand. Bonobos’ rise in recognition has mirrored social media’s popularity arch. As a young company with limited funds, Bonobos didn’t have the luxury of wide-scale advertising like commercials and print. Let’s take a look at how Bonobo relied on its product, customer service, and social media channels like Facebook Timeline, to establish itself as a premier men’s clothing brand. The first thing that stands out in Bonobos’ Timeline is the clothing itself. 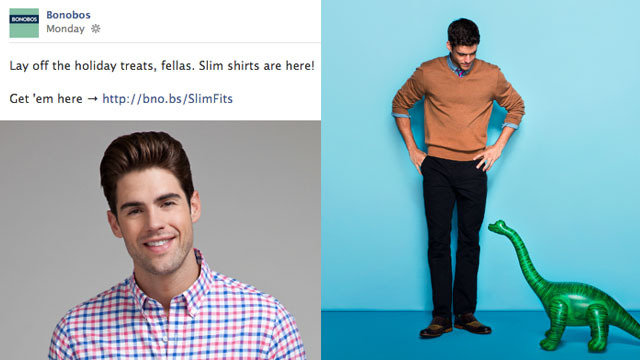 Bonobos posts high quality images, and always keeps its loyal customer base excited with new items and fun looks. For example, many of the images have the models in atypical poses. Instead of the rigid look you might find in a Sears catalog, models can be seen in fun action shots, like jumping, and kicking their legs out. These shots are great because it highlights the comfort of the clothes, while reiterating the brand’s fun loving image. Bonobos’ use of bright colors grabs your attention right away. Many of the signature Bonobos pants are colorful and when you scroll through the Timeline, you’ll see bright shades of orange, blue, green, and purple popping off the page. The colors also help Bonobos posts really stand out; colorful posts (literally and figuratively) garner a lot more attention than other brands without that creative use of color. 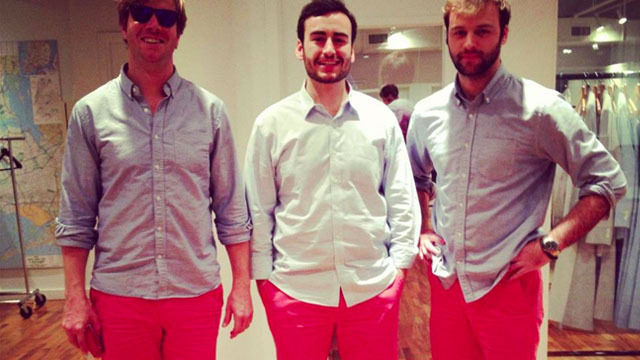 The team behind Bonobos is also an important piece of the overall company brand. For example, Bonobos employees are sometimes used as models for Bonobos gear to highlight the awesome team behind the brand. People seem to genuinely love working there (this is definitely evident if you’ve ever used Bonobos’ customer service) and the team’s enthusiasm and fun-loving spirit are represented wonderfully by the brand. Also, these types of photos display the clothing on real people — and the clothes still look great. Here’s one example of an effective photo: Bonobos took a photo of its accountant in his normal, unflattering clothes, then the team fit him with Bonobos gear and he was a whole new person. Bonobos balances image content between models and employees to great effect. Personality is very important in social media — and Bonobos has it. We’ve seen how the brand uses its products and employees to convey its message. The copy used in its social media marketing reinforces the essence of the brand as well. For a smaller brand, Bonobos has done exceedingly well with Facebook, collecting more than 230,000 fans. The Bonobos Facebook Timeline effectively connects the brand, the product, and the customers together. If you’re looking for a Page to model your company’s Timeline after, Bonobos may be a more practical and achievable option than an iconic brand like Starbucks.